Become Aso UNESCO Global Geopark! On 17 November 2015, during the 38th session of UNESCO's General Conference, the 195 Member States have ratified the creation of a new label, the UNESCO Global Geoparks and endorsed the statutes of a new international programme: the International Geoscience and Geoparks Programme (IGGP). As UNESCO encourages "Building peace in the minds of men and women", Aso UNESCO Global Geopark work on geo-conservation and utilization of precious regional resources for education and regional economic development with our local community. We dedicate our experience to the global society from Aso Caldera. *In September 2014, the new membership was announced at the 6th International UNESCO Conference on Global Geopark in Stonehammer Global Geopark, Canada. 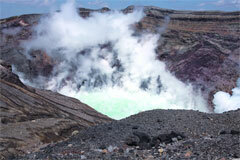 What is Aso Volcano, the Heart of Aso Geopark? 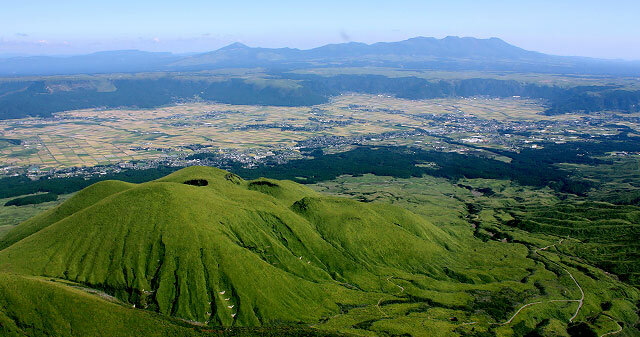 Located in central Kyushu, Aso Caldera measures approximately 18 km from east to west and 25 km north to south. At 350 square kilometers, it is one of the world's largest collapsed volcanoes. In the center of the caldera soars Mt. Nakadake, which even today steams with volcanic fumes, along with the four other peaks comprising Aso Gogaku (Mt. Takadake, Mt. Nekodake, Mt. Kijimadake, and Mt. Eboshidake), which are part of a central cone group made up of many mountains. To the north and south of this cone group stretches the flat caldera floor, encircled by the caldera's outer rim. Beyond that lies gentle topography formed by the volcano's pyroclastic flow. Although there is no freestanding mountain called Mt. Aso, scholars refer to the entire area up to the caldera's outer rim as Aso Volcano. The Aso region was designated as Aso National Park in 1934, the year Japan's national park system was born. In 1986 it was renamed Aso Kuju National Park, and in 2014 the park celebrated its 80th anniversary. Aso Volcano sits at the junction between two lines of volcanoes crisscrossing the island of Kyushu. One runs east-west and includes Beppu, Yufuin, Tsurumidake, Kokonoe, Aso, Kinpo, and Unzen; the second runs north-south and includes Kirishima, Sakurajima, and Kaimondake. This unique location influenced the structure of Aso Volcano and contributed to the complexity of its lithology (the physical characteristics of its rocks).